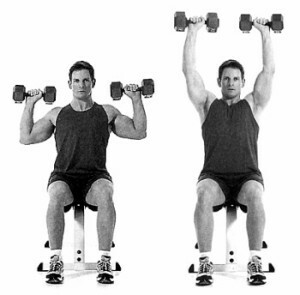 Today I pressed two 70lb dumbbells over head from the seated position for the first time in a long time. I think the most I have ever gotten overhead was 75’s and that was in my creatine enhanced days. The toughest part of pressing heavy dumbbells overhead is getting them from resting on your knees to the starting position. The first rep is a bear since you are basically at a dead stop with the weight at the very bottom of your ROM.